The long nose is distinctive. 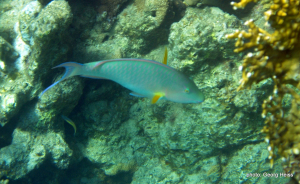 The fish is usually found over sand near corals and very pale colored. It changes to slightly more intense colors (see photo) when it is among corals. It can have an orange band across the cheek, which is however not visible when it is pale. The yellow of the pectoral fins is usually recognizably yellow. The caudal (tail) fin has long lobes. The fish in this photo is about 30 cm long (species can reach 45cm).